HONOLULU — Gov. 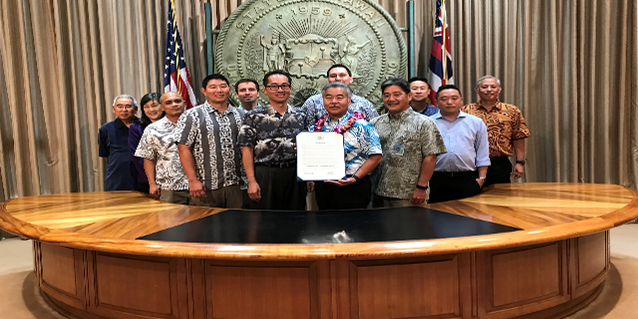 David Ige proclaimed Cybersecurity Awareness Month in Hawaii today in recognition of the state’s role in identifying, protecting its citizens from, and responding to cyber threats that may have significant impact to individual and collective security and privacy. The State continues its work on several cyber security initiatives, such as improving coordination of county, city, state and federal government cyber security activities, leveraging the Fusion Center’s role in working with private sector partners to improve their cyber security posture, developing a skilled cyber workforce by working with lower and higher education community and enhancing the cyber security of critical infrastructure providers. “Cybersecurity is a team effort. We’re collaborating within state and local government, along with private sector partners to improve education, information sharing and resilience to cyber security issues,” said Vincent Hoang, State Chief Information Security Officer, of the Office of Enterprise Technology Services. ETS’ partners in the State Department of Defense and the University of Hawaii are also conducting various cyber security activities this month. For more information, visit https://dod.hawaii.gov/ohs/cyber and https://www.hawaii.edu/infosec/. To learn more about the State’s cybersecurity program, visit http://ets.hawaii.gov/state-of-hawaii-cyber-security-program/. Cybersecurity Awareness Month in Hawaii coincides with the national observance, recognized by the U.S. Department of Homeland Security (www.dhs.gov/cyber), the Multi-State Information Sharing and Analysis Center (www.cisecurity.org/ms-isac), and industry partners which collectively encourage all citizens to learn about cybersecurity to put that knowledge into practice in their homes, schools, workplaces, and businesses. together to increase the understanding of cyber threats and empowering the American public to be safer and more secure online.